As you can deeply feel, we are still fully immersed in the frequencies from the 11/11 Gateway - bringing forth new life experiences as we keep destroying old worlds that no longer resonate with the new state of being that we have been consciously embodying. Now - especially with a wonderful Full Moon at 22 degrees of Taurus tomorrow - it is a time to anchor these new realities into our physical Plane - as we are Masters of New Earth, which involves to descend from the non-physical all those soul visions that we create in the Higher/Invisible Planes, as we came here as physical beings not just to experience the ethereal realms, but to bring them into form into our earthly one as well. 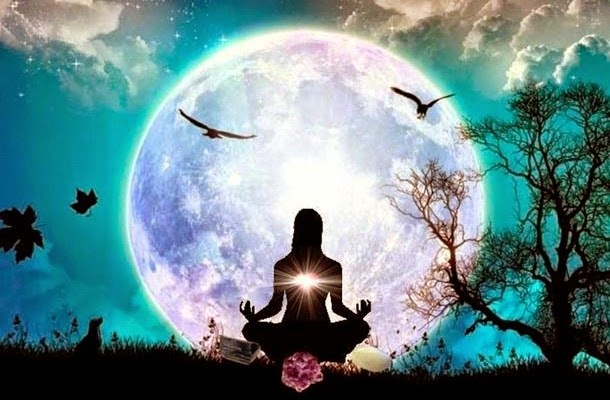 The Full Moon in earthly Taurus - opposing the Sun in Scorpio - is the second of the three Super Moons, and hence, closest and brightest to Earth. This is going to be an abundant, joyful and nurturing one that will help us to connect ourselves with the feminine energy of Mother Earth - the one that sustains us in the physical - giving us the opportunity to manifest all of our heart's desires and everything that we would like to achieve into our tangible plane. Revelations are coming, we just have to know where to look among our human expectations of what we think should be, and let our Soul shows us the True path that will lead us to our true desires. It is now time to honor our tangible realm with this Full Moon in Taurus, which is going to be a fresh and harmonious one with no major astrological aspects. Remember Beloveds, an individual aspect of our Higher Self, resides now into this physical reality, which is never less important that the other non-physical/multidimensional lives that we experience and that we sometimes tune into; our body is also a physical manifestation of the Divine, we should not take it for granted and see it as less pure, instead, we should honor and nourish it as we keep infusing it with the new light codes that we are consciously integrating. Venus, Taurus's rulers, is since November 11, in earthly Capricorn as well. With the Planet of Love and Abundance in this sign, could not be a better time to create infinite abundance, which is simply a frequency we hold within - another form of love - so we can set strong foundations into our lives. If your physical reality is not as you would like it to be, then you need to shift from within all those old beliefs that still impede you to fully see yourself as the abundant being that you truly are in Essence. When what we see in the physical is not what truly resonates with us, it means we have still something to master within. Something we are not being aware yet, is showing us with love, never with judgment, that we should dissolve certain limitations we still possess within and re-program ourselves from those old human illusions. It is also a time for healing past wounds and a self-retrospection period, as the Taurus Full Moon will trine Pluto, the Planet of Power, and sextile to Chiron, the Cosmic Healer as I call it. Together with Scorpion energies, this is a time to let go of what our human self is still attached to, and begin expanding ourselves into the unknown, manifesting not just physical resources but also new relationships - new soul companions that will walk with us as we keep discovering new horizons. As always, it is Law, and we are always in an eternal dance of embracing and letting all go so others can come in and offer us the opportunity to co-create wonderful new life experiences with them as well. This Full Moon is a cosmic gift for us to remember who we truly are in Essence. We are Starseeds Souls experiencing a physical realm, we are not here just to learn or rely on external Forces as hopeless and weak beings. We are already enlightened Souls mastering our human self. We are here to descend our inner spark into our dense plane - remembering through diverse life experiences - that we are the ones with the Divine gift and power to manifest our deepest soul desires in the physical. The outer is a mere reflection of all the different emotions, frequencies, we hold within. We are being shown at this time the importance of aligning our human self with those higher desires we envision, so the outcomes we obtain will be One with our Soul Will and All, for we are always cosmic beings in service to all beings/things in Creation and the illusion of isolation already belongs to the old, as whatever we choose to experience, will always impact All. I wish you a wonderful Full Moon filled with infinite abundance, love, joy and blessings Beloveds! P.S I will share when I can dear ones, as I am very busy with personal services, sessions. Thank you so much for understanding!